It’s not just the scenery that makes the wine regions of Stellenbosch and Franschhoek so spectacular: Visitors can also hit new art galleries, stay at winery lodges and blend their own olive oil. Here, a three-day itinerary. Start the morning with a visit to Solms-Delta, one of the Cape’s oldest wineries and the producer of the region’s best rosé, Lekkerwijn, a subtle, unusual blend of Mourvèdre, Viognier and Grenache with an evocative, lingering finish (its name roughly translates to "nice wine"). The winery’s owner, world-renowned neuropsychologist Mark Solms, just opened a museum on the grounds to pay tribute to the workers who have lived on the property since its founding in the 17th century. 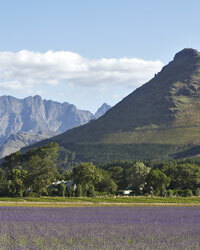 Next, go to the wine estate of Grande Provence, along the road from Solms-Delta toward Franschhoek town. Grande Provence, which has luxurious new guest rooms, recently added a gallery for works by contemporary South African artists like Miela Reyneke. Have lunch at Grande Provence’s fine French restaurant and taste its Shiraz, whose fruity richness is deftly balanced by toasty oak. Then head to Franschhoek town—full of cafés and design shops—and stock up at the country’s best wine and cheese emporium, La Cotte Inn. Try dinner at the new Bouillabaisse, where chef Camil Haas’s globally inflected seafood menu includes a lovely hot-and-sour grilled squid with papaya-mint salad. Then check into one of the new villas at Clouds, an appropriately named winery at the summit of Helshoogte Pass. In the morning, hang out on the spacious balcony of your unpretentious, Tuscan-style villa at Clouds. Then amble through the vineyards and pick up a bottle of the vivid, minerally Clouds Sauvignon Blanc. Today you’ll start by heading in the direction of nearby Paarl for a visit to Delvera, a shopping complex that includes the Vineyard Connection, a well-stocked wine shop that specializes in top South African producers and ships worldwide. Delvera is also the starting point for the network of trails overseen by the outdoor-adventure company Dirtopia. Hike or mountain-bike through beautiful vineyards, keeping an eye out for the extraordinary birds, especially the swooping raptors. The longest walk goes to the summit of a hill blanketed with renosterbos shrubs, named after the rhinos who once fed on the leaves. Then make the short drive to Stellenbosch town for lunch at Greengate, an epicurean market and café that specializes in fresh and organic foods; sample the beer-braised beef and a pea-and-lentil salad, followed by some of the Cape’s best coffee. For dessert, Lecca il Gelato makes authentic Italian ice cream in flavors like tiramisù and zuppa inglese. At the new Olive Tree shop, buy a bottle of South African olive oil (such as the terrific Morgenster), and explore the shop’s wide selection of olive products, like soaps, cosmetics and even olive chocolate. Check into Webersburg, a Cape Dutch manor house with a Jonkershuis, an adjoining cottage where, traditionally, a landowner’s eldest son would live. Both the main house and Jonkershuis have been fully restored and began accepting overnight guests last year. The living spaces are similar to those of the 18th-century colonial settlers: loftlike rooms with thatched roofs, thick walls, wooden beams, high ceilings—and now air-conditioning, too. Drop off your bags in your room, then take a five-minute drive to the Kleine Zalze winery, where you’ll find Terroir, a haute bistro run by chefs Michael Broughton and Nic van Wyk. In the casual, terra-cotta-floored dining room, dine on the signature braised belly of pork with shallot puree or the catch of the day with roasted garlic and white-bean sauce—and a glass of the opulent 2006 Kleine Zalze Chenin Blanc, which has notes of fresh peach and melon. Have a post-breakfast wine tasting of Webersburg’s two classically structured and age-worthy reds, a cassis-and-leather-inflected Cabernet Sauvignon and a fine-textured Bordeaux blend. Next, it’s off to Glen Carlou, a top winery in nearby Paarl that’s now owned by the Hess Group, which also owns Napa’s Hess Collection. The winery’s graceful new art gallery has curvy, luminous white walls and houses some of Swiss financier Donald Hess’s collection of famous international artists; check out the resin figures by Deryck Healey (some with porcupine-like quills on their backs) and the nature-inspired drawings by Andy Goldsworthy. In the gallery’s adjoining lounge, taste the powerful chocolate-and-blackberry-flavored Syrah and the rich, subtly spicy Chardonnay. Then drive to nearby Fairview Wine Estate, famous for its goat cheeses and its red and white wine blends, like the cheekily named Goats do Roam collection. (In 2003, the French government tried to sue winemaker Charles Back over the name, which spoofs "Côtes-du-Rhône." Back reacted by bringing gifts of his wine and cheese—along with protest signs and a packet of goat dung—to the French consulate in Cape Town.) At Fairview’s restaurant, The Goatshed, you can sample the controversial wines and the homemade cheeses—along with artisanal breads and daily specials like rack of lamb with couscous—at wooden tables in the large barn and on the tree-shaded patio. In the expansive wine and cheese shop next to the restaurant, blend your own olive oil by combining oils from local varieties like Mission, Leccino and Frantoio—and take a bottle home. The adjacent vineyard, Seidelberg, is worth a visit too, and can be reached by a short tractor ride that leaves from Fairview every 30 minutes. On the Seidelberg property is a glassblowing studio called Red Hot Glass, where visitors can watch owners David Jackson and Liz Lacey and their staff make gorgeous Venetian bowls and vases in bright, swirling colors. There’s also a new bronze-sculpture studio called Bronze Age, where artisans create striking abstracts, metal furniture and animal figures by heating the metal to 2,192 degrees Fahrenheit. Seidelberg’s café, with its peaceful, panoramic setting overlooking the valley and peaks beyond, is the perfect place to unwind over a glass of the property’s fruity, minty Merlot. End the afternoon at Franschhoek’s Mont Rochelle hotel for a glass of Haute Cabrière’s Pierre Jourdan Belle Rose sparkling wine and awesome views of the valley at sunset. Last stop: dinner at the new Mange Tout, with its Louis XVI-style chairs, its delicious French- and Italian-inspired dishes (like the foam-topped crustacean "latte" from chef Ryan Smith) and its wraparound views of the surrounding mountains. Jean-Pierre Rossouw is the wine columnist for the Cape Times and author of the Rossouw’s Restaurants guide.